When a tree is struck by lightning, powerful forces are discharged. Have you also thought about the fact that when you’re working in sensitive areas lightning comes from your fingers too? 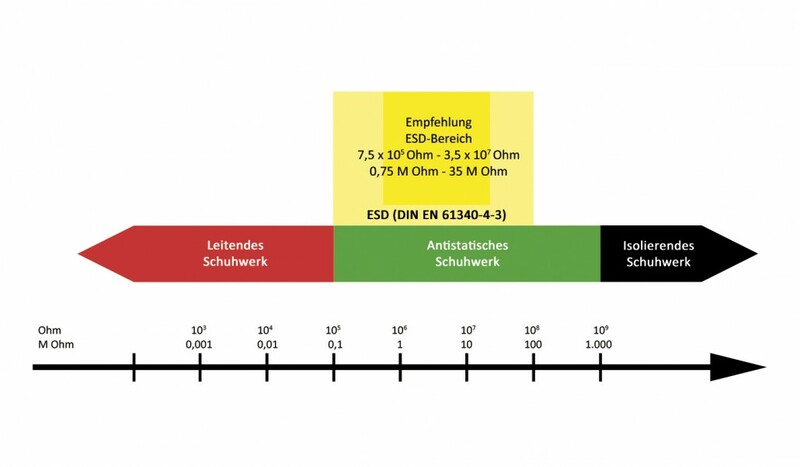 ESD – electrostatic discharge is a daily experience. When you walk over carpet wearing rubber soles and then touch a metal door handle you get a small unpleasant shock, because the electricity charged in your body discharges through the conductive handle. Up to 30,000 volts can flow through the body and yet this discharge generally isn’t dangerous for people. It’s a different matter entirely when it comes to highly sensitive industrial components. While a person only notices an electrical discharge through their fingers from around 3,000 volts, 100 volts of ESD are enough to erase a magnetic data carrier. Between 5 and 20 volts can damage a computer’s hard disc. Electrostatic discharge from people in the micro environment of high-tech production really is like lightning striking a tree. ESD can cause fires in areas where flammable liquids or gas, films or paper are used as ESD can often cause small sparks. In environments like mills which produce a high concentration of dust, in a extreme case a spark can lead to an explosion. The ESD material in Stabilus safety shoes provides effective protection from small, dangerous flashes. Thanks to the conductive outer sole, the conductive leather insole and the conductive insert, designed to work perfectly together, the wearer is earthed and discharged with every step. Warning: Any break in the chain, e.g. caused by using your own orthopaedic insert, which is not conductive, puts the wearer at risk of lightning sparks again! Only certified original insoles from Stabilus or tested orthopaedic inserts that have been approved by Stabilus offer optimum protection.